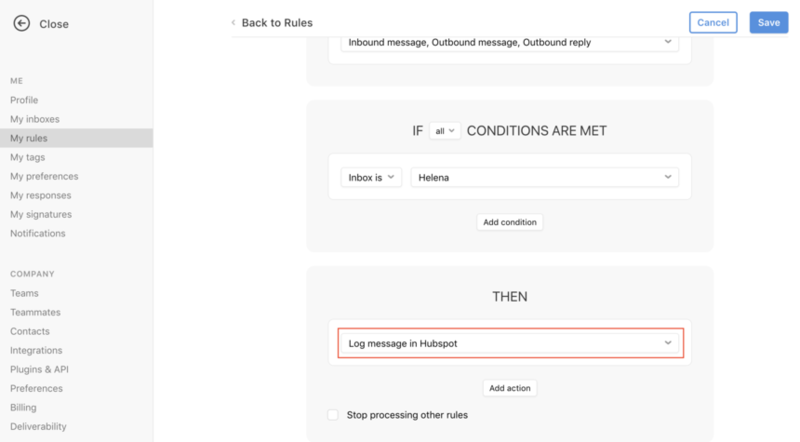 You can also use rules to log messages in HubSpot as activities on the related contact record. Only emails will be logged — texts, tweets, or other message types will not be sent to HubSpot. 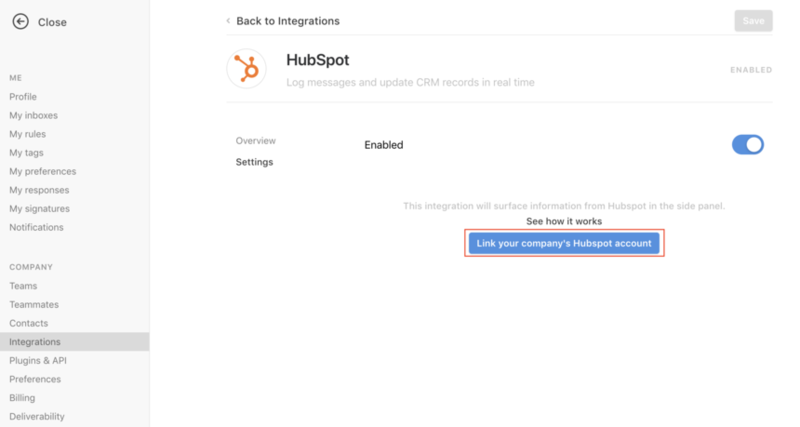 Like other integrations, you need to be an admin in order to enable the HubSpot integration. Go into your Settings and select Integrations. 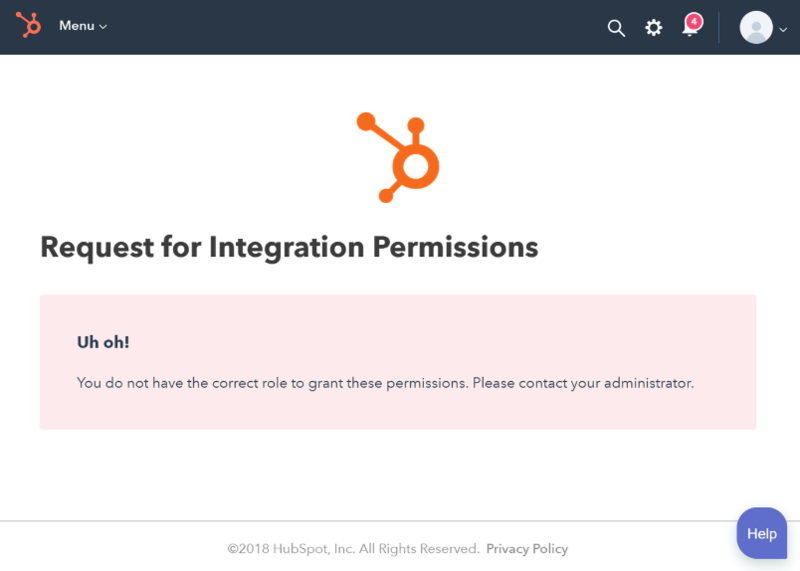 Click HubSpot, and Enable integration. Click Link your company's HubSpot account. Choose an account to link to Front in the popup window. Click Save to finish enabling the HubSpot integration. You can now display contact information from your HubSpot CRM directly in Front. Open the right pane by clicking on the arrow located on the top right corner of your Front interface. Front will use the message sender’s email address or phone number to display the related contact record from HubSpot. If there is no related contact, you can create one. 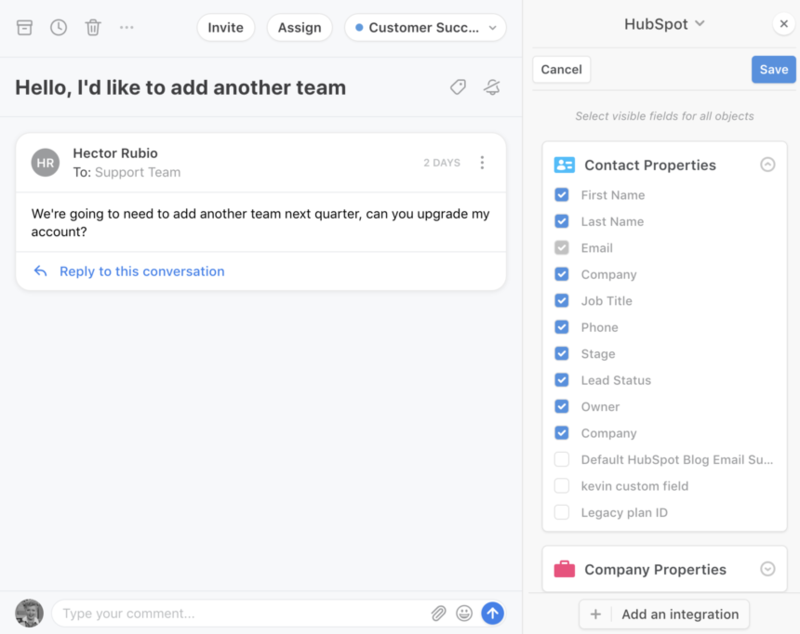 You can use the other buttons to create or edit Contact fields and Companies, Deals, or Engagements related to that contact, and the changes will be instantly synced to HubSpot. Front's Hubspot integration also supports custom fields. To update an object card and manage which fields are made visible, click the 'cog' icon in the top right corner of the integration. Simply expand the card and check the box next to the field you want to be displayed in the main integration view. Let's create a rule to automatically log messages into HubSpot. Team rules will apply to team conversations and private rules will apply to private conversations. Go into your rules and select Add a team rule. 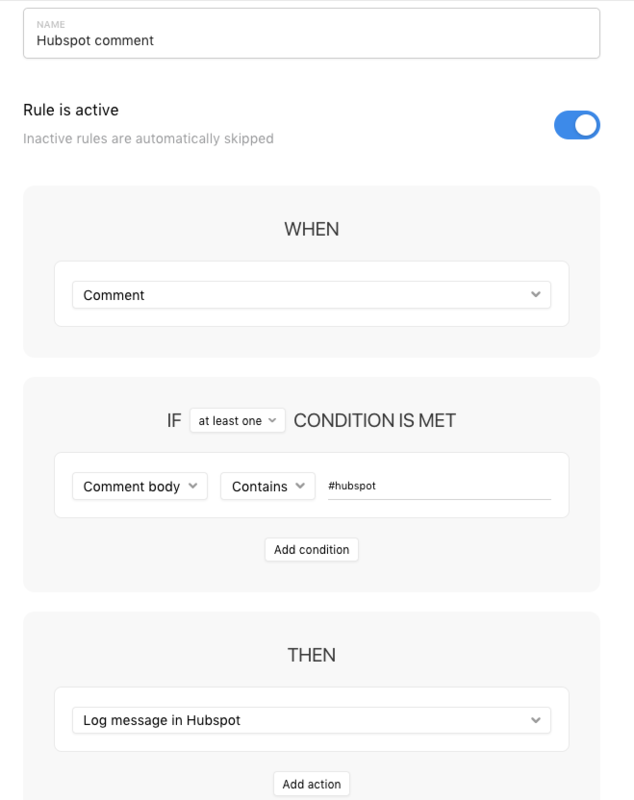 Create the rule using whatever triggers you’d like, and make sure the action is Log message in HubSpot. Note: If there is no HubSpot contact related to the message, the message will not be logged. If this happens, the admin will need to enable all default permissions for the Contacts, Sales, and Marketing categories for all users. Of particular note, users need editing rights enabled for them in order to sign in and use the Hubspot integration. Max Nucci Hi! Currently we only look up the contact by email address. If the Twilio number has an associated email address in your Contact Manager, Front will look it up by the email address and match it that way in HubSpot. Thanks Cori Morris I tried this and works some of the time. I have some sample bugs that I can provide. 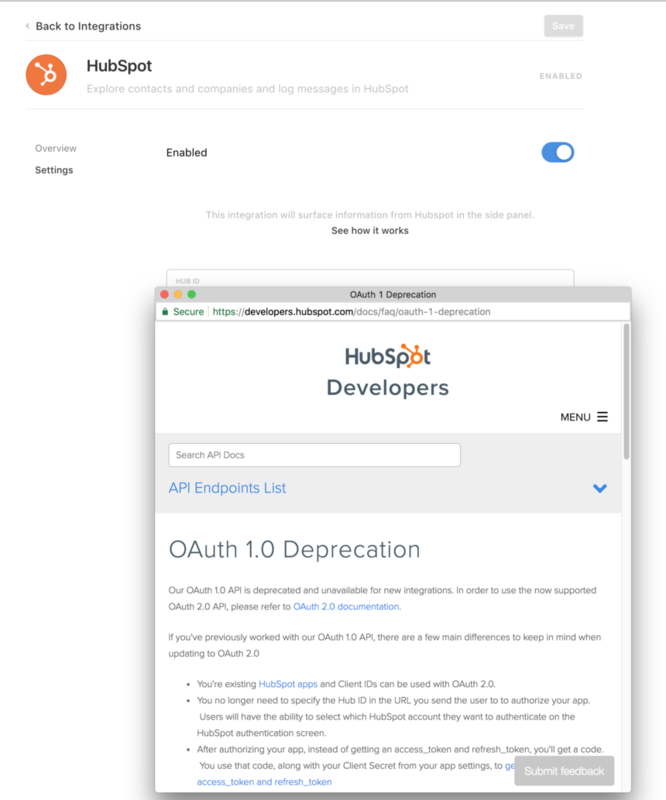 The oauth method seems to be depreciated? When i try to integrate, this is the pop-up that i get. You may need to upgrade to allow this to connect. Jeff - POW! Thanks for reporting this issue. We're working on a fix, but it may take a few days. I'll let you know when the fix is live. Cori Morris +1 -- we're having the same issue. Looking forward to the fix. Christian Rodriguez & Jeff - POW! The integration has been fixed. Please retry! I just tested it, and unfortunately, it's working with outbound and inbound messages but not with the #hubspot in the comments. Can you help me with that ? We'd be happy to help troubleshoot this. Please email us the name of the rule and send over a Conversation ID for a conversation where the rule should have triggered but didn't. That will help us investigate further. Is it possible to add a "View in Hubspot" link to the widget, so that you can quickly view the CRM record in Hubspot? Would save a lot of time. Hi Max, in the plug-in side panel, click on the email address of the contact, they should go directly to hubspot. thanks! This is great! Thanks Kenji Hayward !